Evolution stands out among the clothing stores and restaurants in Manhattan’s SoHo art district as a truly distinctive and handsome shop. 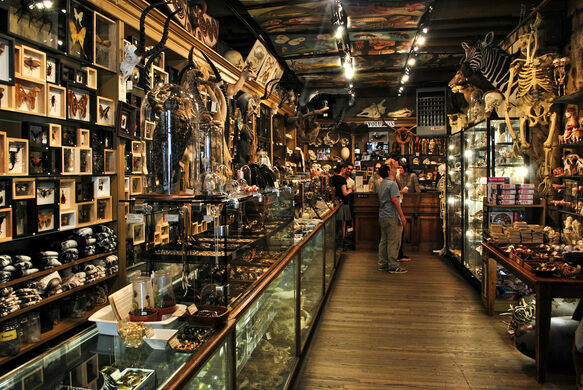 Tucked into every corner and crevice of the wood-panelled store are unique natural history collectibles. 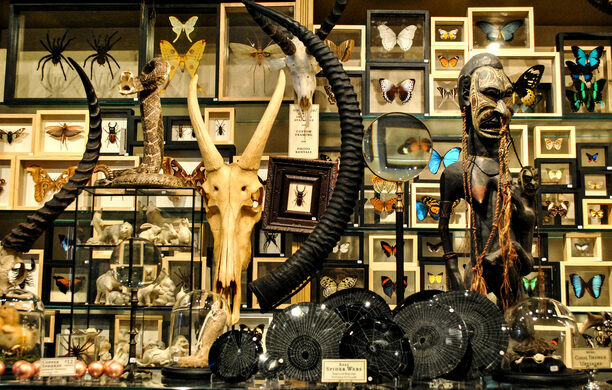 Framed butterflies and insects line the walls, fossils and seashells in jars crowd wide tables, tribal art fills glass cases, skulls and skeletons hang from the ceiling, and medical models and posters fill every spare space. Evolution’s staff is knowledgeable and enthusiastic and they welcome questions about their natural wonders. Their specimens are acquired from the same experts who supply museums, and are of a high quality. It is worth stopping by just to marvel at the articulated giant sloth skeleton. Despite the scandalous circumstances surrounding the store’s founder, it now authorized and licensed by the appropriate authorities.